When he came to live by the banks of the Ganges, Advaita Acarya was very happy to get his association. The brahmana residents of Fulia were very pleased to see how he worshipped the Holy Name, and they used to come everyday to have his darshan. Gradually word began to spread of his glories. When the Mohammedan administrator came to know of all this he began to burn with malice and went to the local Mohammedan king to inform him, "Though he is Mohammedan, he behaves as a Hindu, are therefore he should be brought here for trial." Hearing the words of that sinful man, the local king who was also very sinful, had Hari das Thakur brought there immediately. [C. B. Adi 16.37]. The Mohammedan King told Haridas, "Just give up this chanting and say the Kalma (prayer of the Mohammedans)." Haridasa Thakura replied, "The Supreme Lord is one, though His names might be different. The Hindu shastras are the Puranas and the Muslim sastra is the Koran. Everyone acts as he is inspired by the Lord, as also do I. Some yavanas become Hindus and some Hindus become yavanas, to worship the Lord. O Maharaja, you can now judge me." Hearing these words the Kazi replied that it would be necessary to punish him. Hearing the decree of the Kazi, the Muluk pati addressed Haridasa, "My brother, just follow your own religion. Then you will have nothing to worry about. Otherwise you will have to be punished." After hearing these words of Haridasa spoken with great determination, the Kazi declared, "He should be beaten in twenty two market places. If he doesn't die after this, then I will know that the learned gentleman speaks the truth." Thus having heard the words of the Kazi, the sinful Muluk pati then ordered that Haridasa Thakura be beaten in twenty two market places. Haridasa remembered the Lord by chanting "Krsna Krsna", and in the happiness of that remembrance, he didn't feel any bodily inconvenience. [C. B. Adi 16.102]. As the demoniac associates of Hiranyakasipu tried in so many ways to kill Sri Prahlada Maharaja, but were unsuccessful, similarly the demoniac Mohammedans, though they tried to harm Haridasa Thakura, were unable to do so. Haridasa Thakur was immersed in the nectar of the Name and thus gradually the Mohammedans could understand that he wasn't an ordinary person. Thus they humbly submitted to the Thakura, "Haridasa! We can understand that you are a genuine saintly person. No one can do anything to you. But the Mulukpati won't understand any of this. Rather he will have our heads." Hearing their frightened please Haridasa's external consciousness ceased and he entered into deep meditation on the Lord's Holy Name. Then the Mohammedans carried his body on their shoulders to the Mulukpati, who surmised that he was dead. Thinking as such he ordered that his body be thrown in the Ganga. Haridasa's body floated down the Ganga until he reached Fulia ghat, where he got out of the water and began to loudly chant Hari Nama. Seeing the greatness of Haridasa Thakura, the Mulukpati became fearful. Along with the other Mohammedans he came there and begged Haridas Thakur to forgive him for his offence. Haridasa Thakur used to chant Hari Nama in a hollowed out cave like hole at the base of a tree. This "cave" still exists near Fulia, on the banks of the Ganga. One can get there by train from Santipura. Within the roots of this tree also lived a poisonous snake. Being fearful of this snake the devotees couldn't remain there for very long and one day they mentioned to the Thakura about this snake which was worrying them. Seeing the distress of the devotees Haridasa Thakur called to that snake and spoke to him, "My dear sir, if in fact you are residing here, then I am requesting that you please leave by tomorrow, otherwise I myself will definitely leave here." Thakura Haridasa was present during most of the Lord's pastimes in Nadia, and when the Lord went to Jagannatha Puri, Haridasa also went and took up residence there. 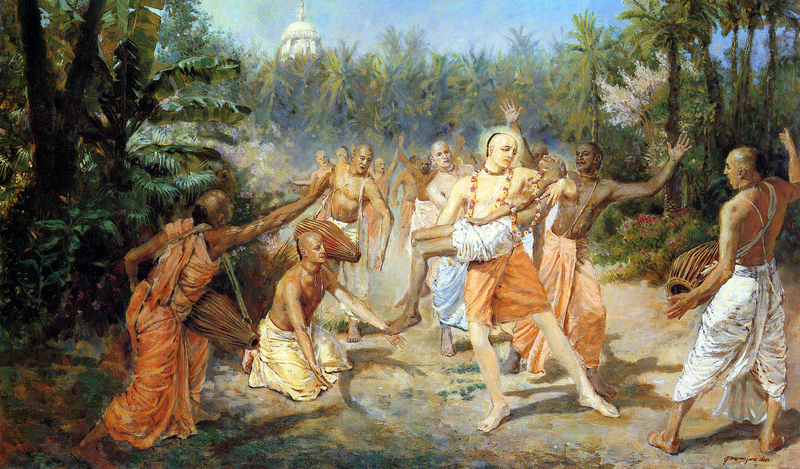 Everyday, after attending Lord Jagannath's mangal arati, Lord Caitanya would come to see Haridasa Thakura and would bring him some of Lord Jagannath's prasadam. When Sri Sanatana Goswami and Sri Rupa Goswami would come from Vrindavana to Puri they used to stay with Haridasa Thakura. Haridasa, in order to maintain the etiquette, would not go near Lord Jagannatha's temple but would offer his obeisances to the Cakra on top of the temple, from a distance. As he was considered to be a Mohammedan by birth, his presence in the temple would be objectionable to those who were caste conscious.